It’s fair to say that when Peter Sagan came on the scene it was like watching a lion cub trying to find his bearings. A lion, yes, but still a cub finding his place in a very crowded world of pro-cycling giants. Not that Sagan wasn’t winning any races, nor making people turn in awe – he’d been racing against adults and leaving them in his wake since his teens, but that was on the bike. Off the bike, he was noticeably far from being the leader of the pride. 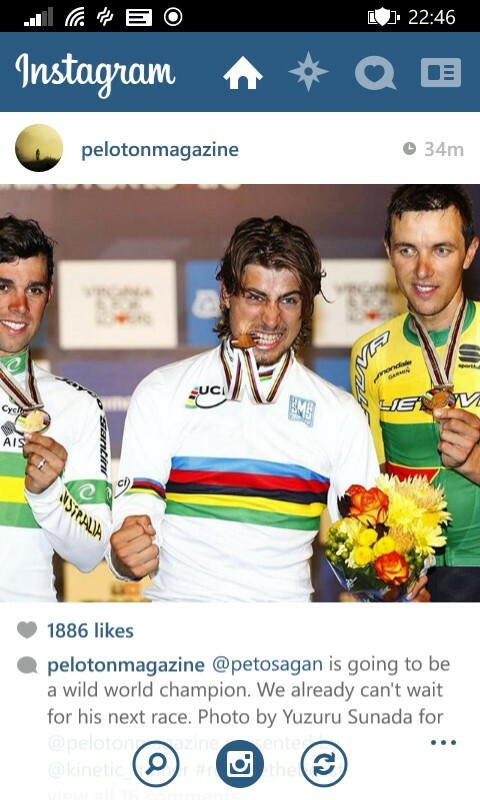 Today is very different, Peter Sagan is the champion of the world. And he dons a very fitting mane, just like a great lion should; and rainbow colours, just like a great world champ should. Ever see a Lion fly? Yes, but even ‘Fastvak’s’ need a good team behind them. Just the year before, Kwiatkowski had an armada of 8 fellow Poles exclusively helping him nail the 2014 World’s. 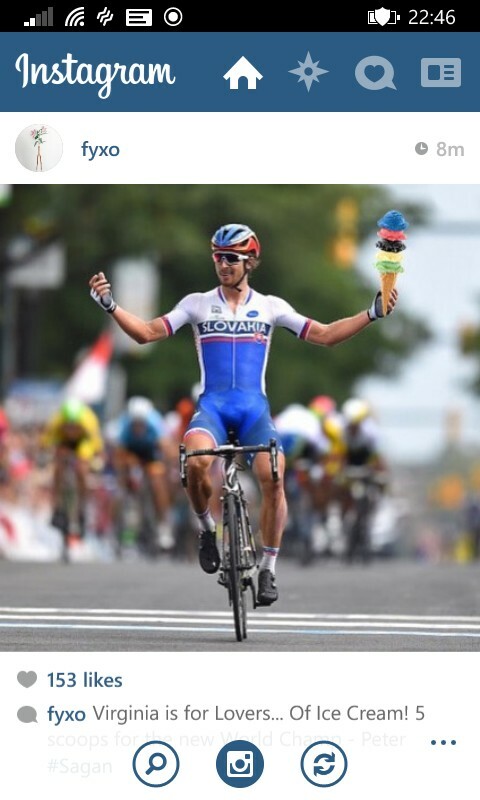 Today, Sagan only had his older brother, Juraj Sagan, and Michael Kolar to back him up for a Rainbow finish, and it seems, that’s all he needed. It’s interesting to note that besides being fellow countrymen, all 3 riders currently ride for Tinkoff-Saxo. Which goes to show, you don’t necessarily need a big team to bag the prize – concentrated training, combined with extraordinary efforts, can work equally well; which they did to excellent effect. 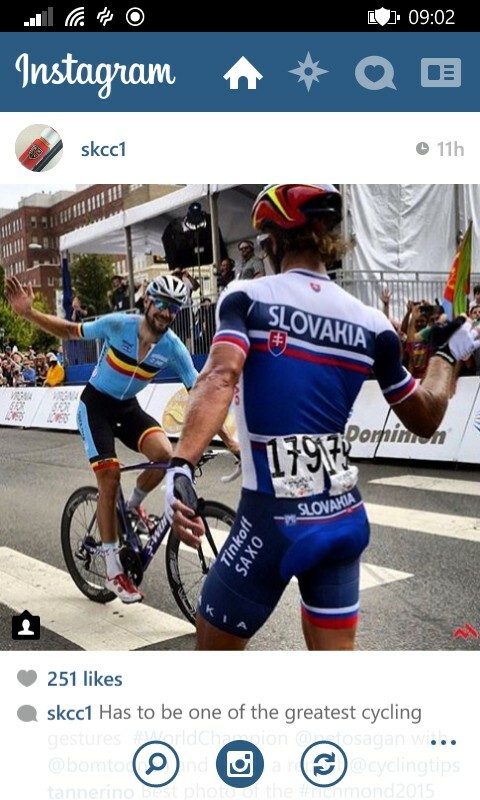 Flexing it Sagan style – from Laura, to podium, to bike and hi-fiving Boonen. There’s more to Sagan than just bike skills. Lengthy manes nor rainbows maketh the man. As much as Sagan would triumph in the racing world, he wasn’t always making headlines for the right reasons – wearing t-shirts adorn with adolescent humour, or letting his fingers get too close to a certain podium-lady’s bottom. The media were quick to tell the young man what was appropriate and acceptable for a neo-pro in the constantly in the limelight for his enviable bike skills. Yet, to Sagan’s credit, he would instantly apologise without reservation. In hindsight, he was expressing himself as a boy with bags of energy usually does, making mistakes along the way to eventually finding his stride. Like many great road-cyclists, Sagan went through the follies of football, to mucking it on the MTB circuit before hitting the tarmac. 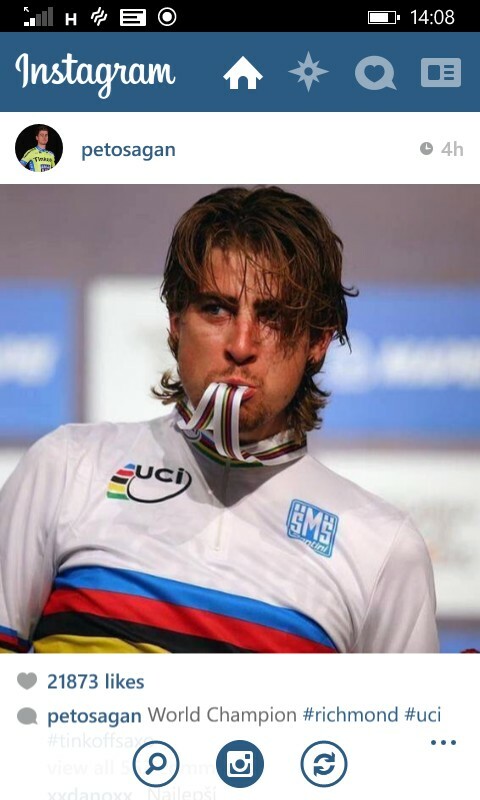 We’ve been talking about Sagan like he’s been around for donkeys-years, but it’s sobering to think that the Fastvak was just 19 when he won the Junior World Championships. He’s now come full circle and we expect more exciting moments for this maturing Lion. Rouleur magazine aptly describes Sagan as ‘Box Office’ material. He’s been called the ‘Tourminator’ and the ‘King of California’; but we can now call him something more fitting – the World Champion. Long live this king!